Nearly three out of 10 online shoppers have taken the plunge to buy an item that costs $1,000 or more. Men are twice as likely as women to press click and buy a big-ticket item, according to a new NPR/Marist poll. The poll found that 27 percent of online shoppers — regardless of gender — have taken taken the plunge on big-ticket items ($1,000 or more). It's the evolution of digital commerce from the Web's early days in the 1990s, when people worried about giving out their credit card information and fretted over returns and whether products would even arrive. Today, many shoppers are willing to make even their most cherished and expensive purchases online. NPR reached out and heard from dozens of them, people who've bought musical instruments, a diamond engagement ring, a computer numerical control machine tool, a Porsche Boxster, an above-ground pool, signatures of historical figures and props involving Han Solo and Xena: Warrior Princess. Alan Kwok, 28, of Austin, Texas, bought a lab-grown diamond engagement ring online for around $11,000. "If anything buying online is easier and safer," he said. He thinks it's much more efficient when it comes to expensive items like jewelry because at stores there's a limited selection and a customer can only see a few items at a time. Online, the shopper can browse through a huge digital catalog: it's easier to find what you're looking for. 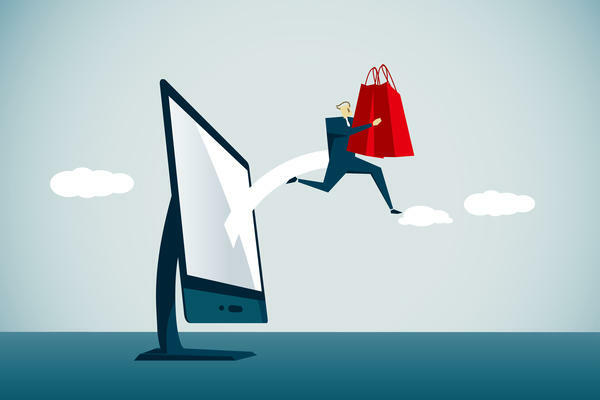 Speed and convenience are two factors why many men eagerly make major purchases online, said Americus Reed II, a marketing professor at the University of Pennsylvania's Wharton School. Thirty-six percent of men shopping online have bought an item that costs $1,000 or more, compared to 18 percent of women, according to the NPR/Marist poll. "What the research has shown is that men ... go to the store quickly, kind of gather as much information as they can quickly and just buy it online, particularly because it's just faster," Reed said. Other factors may also explain the discrepancy between men and women. On average, men have higher incomes. They also tend to be early adopters when it comes to technology, according to Sucharita Kodali, an e-commerce analyst with the research firm Forrester. "If you were to consider high end e-commerce purchases as something that historically had a lot of holdouts, the gender I would expect to be the first to experiment with it would of course be men," she says. Then there's the matter of physical stores, especially the ones with shelves stacked with clothing. Lots of men avoid these places whenever they can. In general, Reed said men find less enjoyment out of going to a store and finding a bargain than women do. They'll shop and compare online, but not at the mall. These are generalizations, even stereotypes. But there's enough truth in them to create demand for a luxury online men's fashion store like MR PORTER that sells brands including Tom Ford, Loro Piana, Prada and Burberry. Prices range from $20 for a pair of socks to $66,000 for a Jaeger-LeCoultre gold watch, said Toby Bateman, MR PORTER's managing director. Bateman said that, early on, men lagged behind women in making fashion purchases online, but that's changing. And the retailer's analysis shows that click and buy is their customers' method of choice. "We know that 65 percent of their fashion shopping is done online," Bateman said. "That's a phenomenal figure because that really defines them as being more digital creatures than physical in the shopping sense." When Rick Hays of Tallahassee, Fla., goes online to shop it's not for high fashion. He's more interested in American history and literature. And he has no qualms about a big purchase he made last year on an online auction — even though it's just two sentences long. "I purchased a note that Mark Twain had written regarding a missing package and I paid about $1,500 for it," Hays said. Hays said his wife has very different buying habits. "She struggled with buying a $100 dress recently online," he said. "She wants the experience of seeing it, the tactile experience, I think, of being around whatever item she wants to get." Hays said there may be another reason he's the more adventurous online shopper: His wife is still working. He's retired. So he's got more time to browse. And last week Hays struck again — buying a signed picture of Muhammad Ali for $1,020. He says he was willing to go higher. Americans are not just shopping online. They are buying pricey items on the Web. Nearly 3 out of 10 online shoppers in the United States have bought a product that costs a thousand dollars or more. That is according to an NPR/Marist poll. And as NPR's Uri Berliner reports, those big online spenders are much more likely to be men than women. URI BERLINER, BYLINE: The early days of the Web were pretty cumbersome. UNIDENTIFIED ACTOR #1: (As character) How long have you had this? UNIDENTIFIED ACTOR #2: (As character) About a week. And it's so easy. All you do is point and click. UNIDENTIFIED ACTOR #1: (As character) But how does it work? UNIDENTIFIED ACTOR #2: (As character) All you need is a computer and a regular phone line. BERLINER: It felt risky. People were afraid to give out their credit card numbers. They worried, if products would arrive, would they be able to return them? Sucharita Kodali is an analyst with Forrester Research. She says gradually online shoppers dipped their toes in the water. SUCHARITA KODALI: And it would start with relatively low-ticket transactions, like a book, and that really was, I think, the beginning of it. BERLINER: The it she's talking about is the explosion in Internet shopping. Last year, U.S. shoppers spent $453 billion on retail purchases online. And many of them go big. Twenty-seven percent of online shoppers have bought an item that costs $1,000 or more. What do they buy? Just about anything. CARA VETOR: I purchased an infrared sauna online for about $1,100 in 2015. ANDY PENNELL: I bought a full-size movie prop of Han Solo in carbonite for $1,800. ALAN KWOK: I bought a lab-grown diamond engagement ring online for $11,000. KENNA MCKENZIE: Two harps. My latest harp cost $1,800. BERLINER: That's Cara Vetor of Indianapolis, Ind., Andy Pennell of Kirkland, Wash., Alan Kwok of Austin, Texas, and Kenna McKenzie of Tucumcari, N.M. If you dig a little deeper into the habits of online spenders, a striking fact emerges. Men are twice as likely as women to buy an item online that costs a thousand dollars or more. Guys have twitchier fingers. Kodali says she's not surprised. Men are usually the early adopters when it comes to technology. KODALI: If you were to consider, you know, high-end e-commerce purchases, and something that, you know, has historically had a lot of hold outs, the gender that I would expect to be the first to experiment with it would, of course, be men. And I think that's why you're seeing the breakout that you're seeing. BERLINER: Americus Reed, a professor of marketing at Wharton, believes there's another factor at work, too. AMERICUS REED: What the research has shown is that men tend to, if they are going to check something out, go to the store quickly, kind of gather as much information as they can quickly and just buy it online, particularly because it's just faster. BERLINER: Rick Hays of Tallahassee, Fla., has no qualms about a big purchase he made last year at an online auction, even though it's just two sentences long. RICK HAYS: I purchased a note that Mark Twain had written regarding a missing package, and I paid about $1,500 for it. BERLINER: Hays says his wife has very different buying habits. HAYS: She struggled with buying a, you know, a hundred-dollar dress recently online. You know, she wants the experience of seeing it, the tactile experience, I think, of being around whatever item she wants to get. BERLINER: Hays says there may be another reason he's the more adventurous online shopper. His wife is still working. Hays is retired so he's got more time to browse. And just last week, Hays struck again, buying a signed picture of Muhammad Ali for $1,020. He says he was willing to go higher. Uri Berliner, NPR News. WEIRD AL YANKOVIC: (Singing) I bought it on eBay. Want to buy a "Pac-Man Fever" lunchbox? Want to buy a case of vintage tube socks? Transcript provided by NPR, Copyright NPR.